GoS-DB is a comprehensive collection of facts and figures for every first-team match and player since Plymouth Argyle became a professional football club in 1903, together with a series of web pages to present the information. Every match and player is included, but the database will grow as more information about them is captured and stored. Version 1, made available in September 2009, took six months to develop, but that's just the start. New data items will be added as time allows (e.g. photos, player descriptions, match reports) and, with your ideas, new reports developed. I'd be the first to agree that GoS-DB isn't for everyone. For some it'll be little short of hell on earth; for others I hope it's a useful place to to find some answers. For one or two it might even be a place of endless fun. If that's the case, it'll have all been worth it. If you have a special interest in Argyle's playing history, perhaps as a journalist or author, and would like a bespoke report to address an area of research, please get in touch. I'll do my best to help. The Hub is GoS-DB's entry point, linked to from Greens on Screen's home page. Here you'll find a couple of 'taster' tables - top tens for appearances and goals scored, each displaying an 'all players' and 'current squad' view, and each having the option for 'all matches' or 'league only'. The centre portion is the main focus of the page. Under the graphic is a small paragraph that ends with 'from 1903 to ...', followed by the date of the last game. This is an important point for GoS-DB as a whole: the database is updated within a few hours of each match; then every display sees that information and takes it into account (for instance, the current squad's appearance counts will automatically change). Below the date are the four fundamental ways into GoS-DB - by date, season, opposition and player. These are described in more detail below. The four key access routes offer considerable choice to tailor their displays. By contrast, the final options on the Hub, Miscellaneous Reports, are simple, static lists - although still kept up-to-date, if appropriate, after every game. GoS-DB version 1 provides three such reports, but the number will undoubtedly grow and we'll hopefully end up with a long list, including your suggestions. In some ways, this one's a bit of fun and should only to be taken seriously by the superstitious. The left and right-hand tables list the most and least successful days of the year, measured over every season in the club's history. For instance, 15 December is good, 30 December is bad! On initial display, the page shows a performance breakdown for the current day, but this can be changed to any of the year's 295 days when a match has been played. As well as the summary figures, every game played on the chosen day is listed. Otherwise known as Head to Head, this feature tells you everything there is to know about the Pilgrims' performances against every team ever played. The initial display gives all-time totals, but allows the selection of competition type, home or away and season ranges. Select an opposition to see the details of every match played, with summary displays for overall totals, best and worst scores and how long since we last won/drew/lost. More tongue in cheek, there's also a 'success ranking'. The Seasons' Results page is a mass of numbers that summarise, per season, Argyle's playing record. The page comes into its own when you use the 'order by' facility to bring out the most and least of any aspect. Want to know when we've drawn most often away from home? This'll tell you. 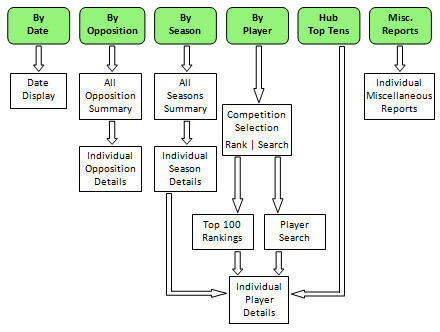 Choosing a season then brings up its full details, including players who played that year, a team photo, the final table and full details of every match played in all competitions. The first three ways are geared towards dates and matches. This one focuses on the players. It begins with an option to select the scope of the facts and figures presented. Up to seven categories can be chosen; if all are selected, every match ever played will be considered. There are many published records for Argyle's players, but the scope of their counts are sometimes unclear. Does 'Cup' include the League Cup? What about the Freight Rover Trophy? Does 'Football League' include the abandoned season of 1939? Yes, these are important questions! The choices here mean that the scope is quite clear. By Player Search - enter the first few letters of a surname to see all possible players. Each method provides a list of players. Select a name for that player's full Argyle record, and more.